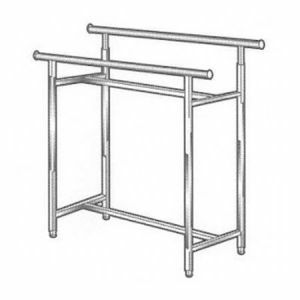 Spiral Costumer Rack, Satin Nickel, 61" x 18" x 18"
Adjustable Ballet Bar, Satin Nickel, 49.64" x 42.3" x 24"
Ball Spiral Rack - 29 Ball Stops, 18" weighted base, 67" high. Top is threaded for a card holder. Revolving Single Tier Belt Rack - 52 high Rack, Belt tier is a 19" diameter ring with 20 hooks, 18" weighted base. Top is threaded for a card holder.